Warning: This picture essay contains graphic images which some people may find upsetting. Vanity has always provoked huge interest, especially in the arts. In Greek mythology it was expressed in the figure of Narcissus, whose story, like that of Lucifer, and Adam and Eve, underlines its insidious aspect. Friedrich Nietzsche wrote that “vanity is the fear of appearing original”, meaning that taking futile pleasure in yourself is a way to exorcise the terror of not being. Through photography I wanted to create a document that would spell out the price of vanity. 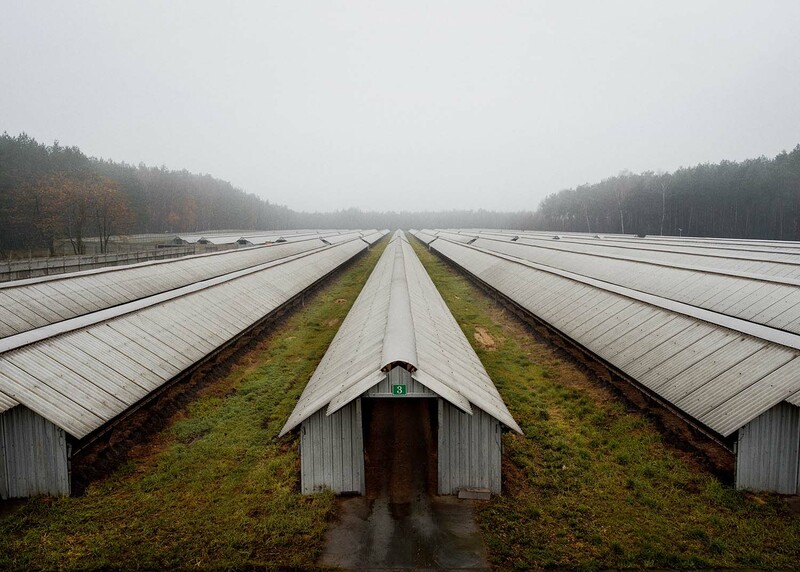 A mink farm near Posnan, western Poland. 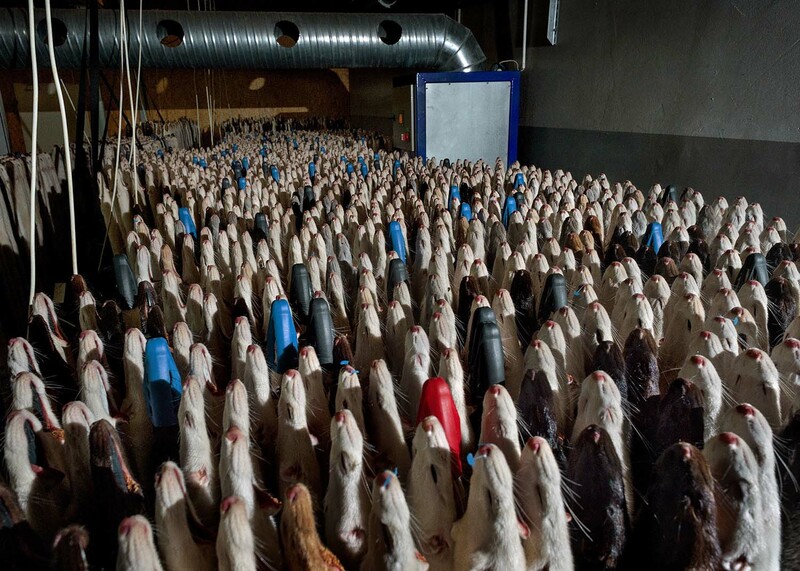 The farm is one of the largest in Europe, breeding tens of thousands of mink a year inside its hangars. 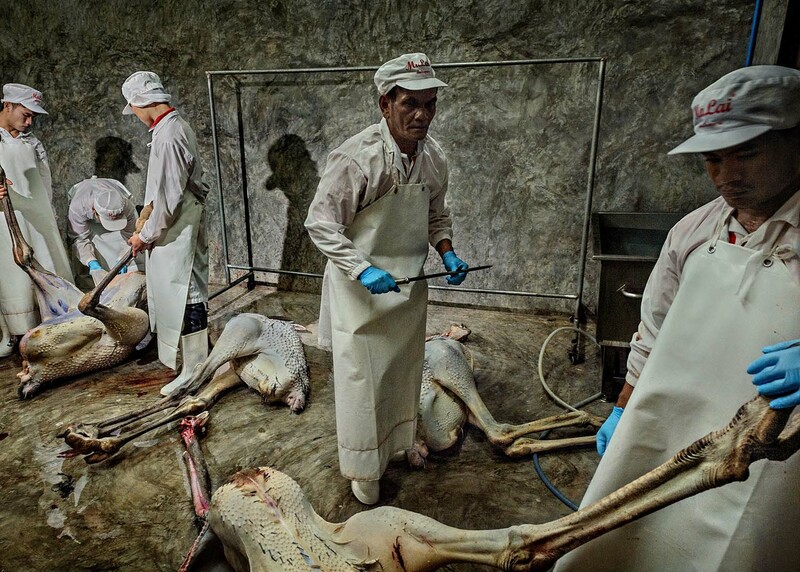 Their skins are destined for export to China. 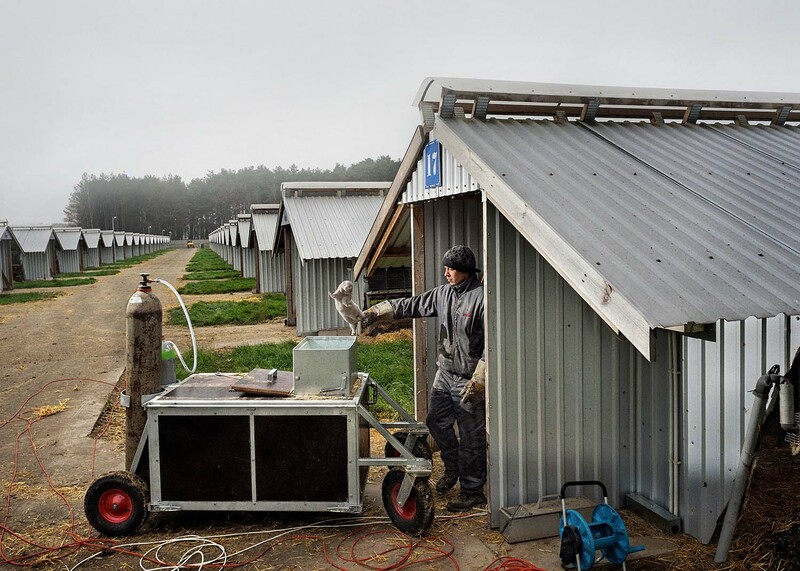 We all know about the industrial techniques of intensive farming. But much less is known about the huge business of producing animal skins for the global high-end fashion market. I wanted to reveal the true cost that lurks behind the ruthless values expressed by high fashion and its remorseless standards of beauty. The global business is worth billions of dollars, supplying famous brands including Gucci, Hermès, Cartier and Burberry. Italy and France alone account for half of the demand in Europe. When they are fully grown, the mink are killed using gas. The list of animals farmed to produce fur, feathers and leather is a long one, from fox, mink and chinchilla to crocodiles, ostriches, cattle, rabbits and reindeer. The industry’s practices have long been opposed by animal rights movements, leading to massive anti-fur campaigns, especially in the 1980s and 1990s. 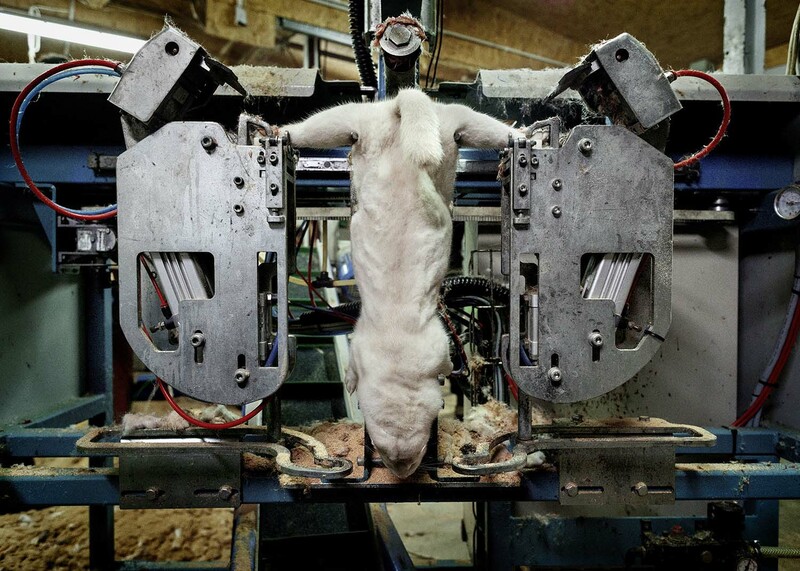 Yet since 2013 – a boom year for fur – production of animal skins for fashion has more than doubled compared with the 1990s. 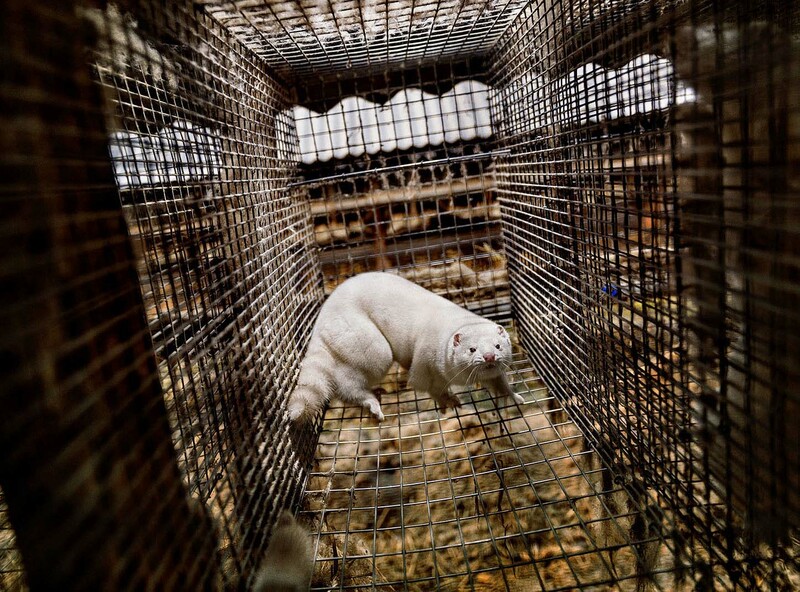 Last year, 100 million fur coats were produced across the world. 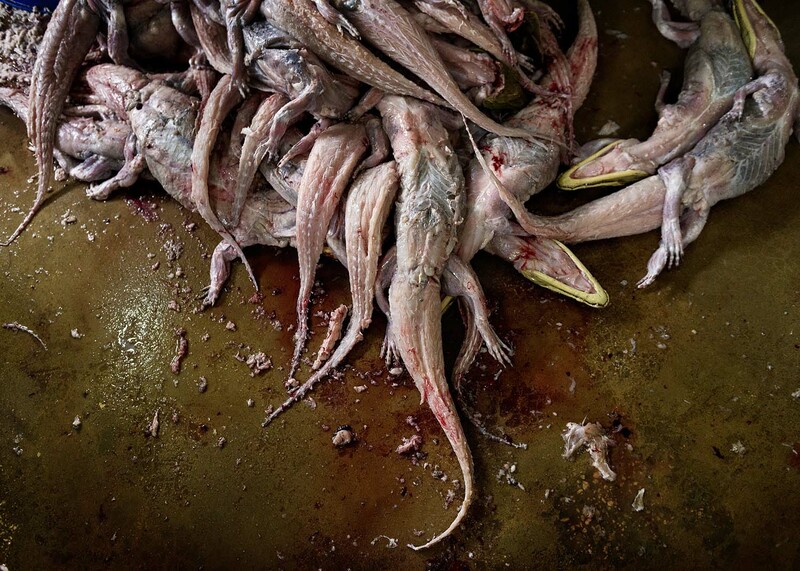 The carcasses are taken to a warehouse and placed on conveyor belts to be transported to the various rooms where the skins are separated from the bodies. Among the many initiatives taken to protect animals and the environment, some have been very important, such as the CITES, the Convention on International Trade in Endangered Species, from 1975, which prohibits hunting and the commercial exploitation of certain species of animals. Many brands of high fashion pay lip service to animal rights but, in fact, what has never changed is the awareness of the great compromise that this industry represents. The world’s leading fur farmers are Denmark, Poland, Finland and Russia, as well as China, the US and Canada. 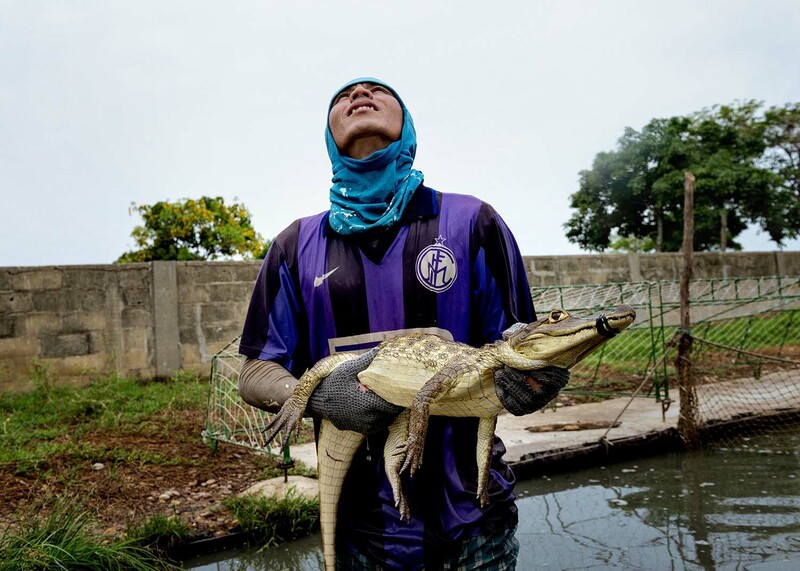 For crocodile skins, Brazil and Colombia are major players. 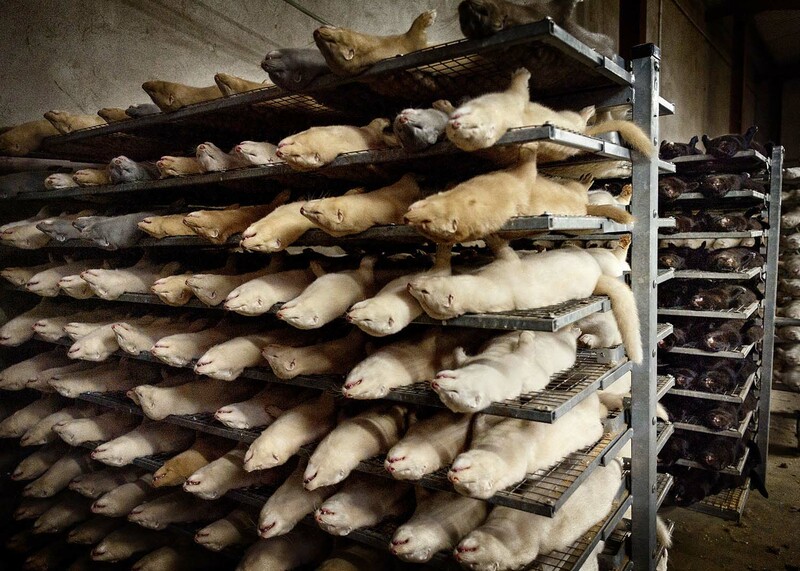 The animals are stored in a temperature-controlled warehouse before being skinned. 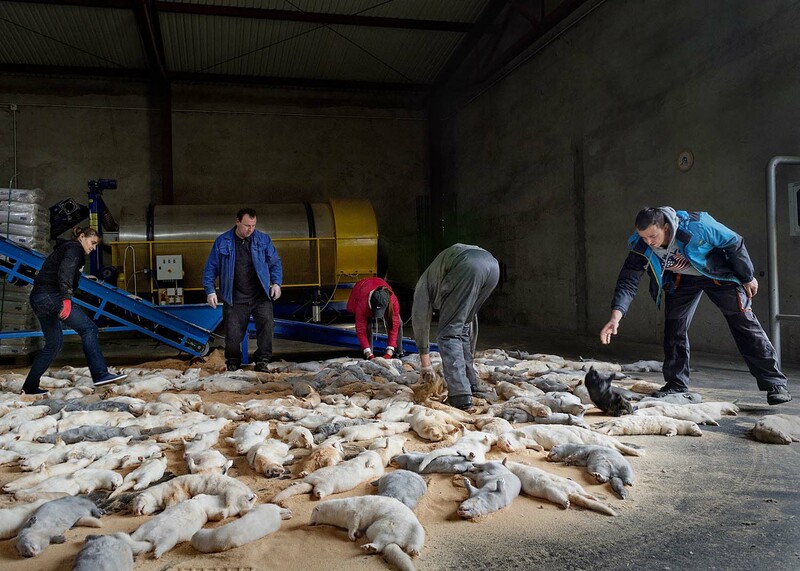 The company processes about 6,000 mink a day for two months a year. This project is not against breeders but aimed at all of us ordinary citizens. Perhaps it is time for new laws and a new awareness. We must know the history of what we buy and stop being blind buyers in the name of vanity. 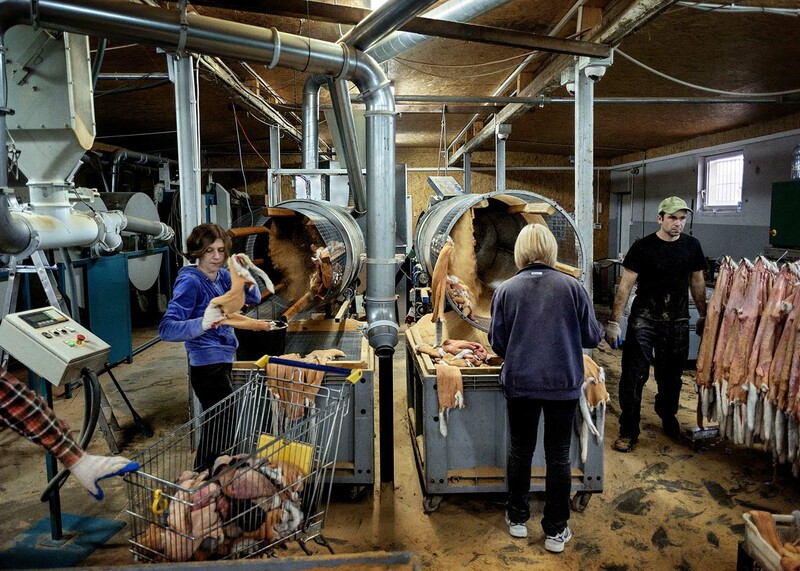 Machines are used to remove the pelts, which are then dried and cleaned. 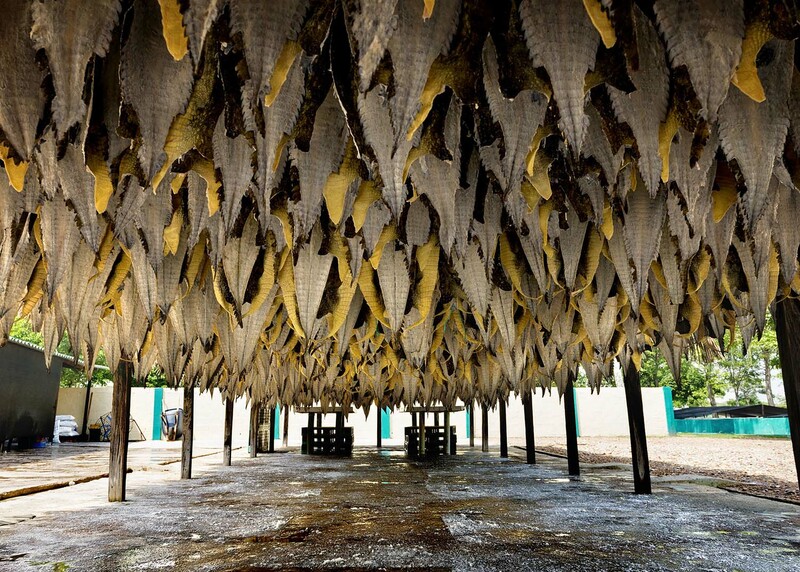 The empty skins are arranged on stands inside special driers. Workers unload the newly stripped pelts. 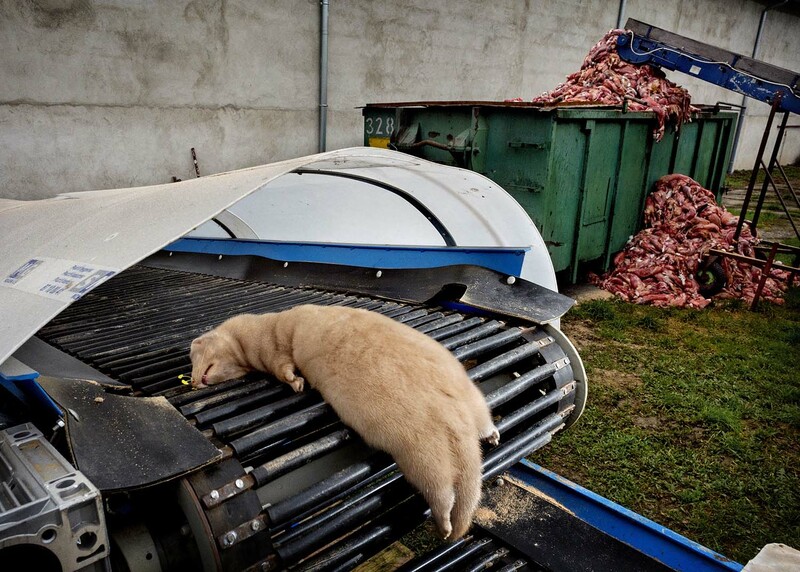 A mink arrives by conveyor belt, with stripped bodies dumped in a container. 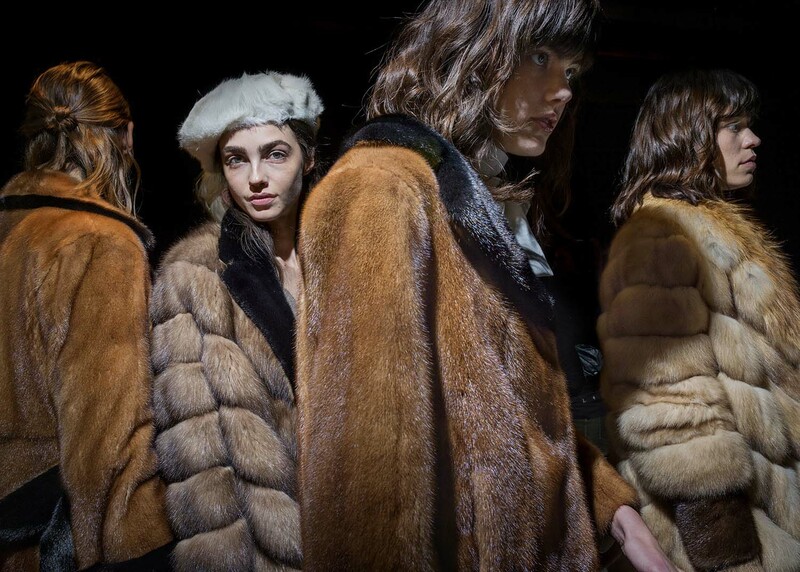 Fur coats at the annual show by Italian designer Simonetta Ravizza in Milan. A model shows off a coat at Braschi, Milan, one of the most renowned fur designers. 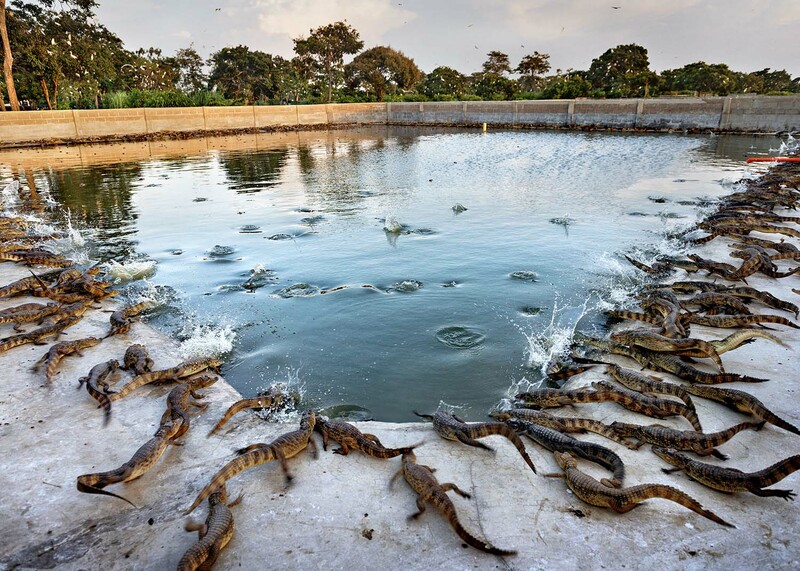 A crocodile farm in northern Colombia. After hatching, the baby caimans, about 70cm long, are moved to a range of different tanks. 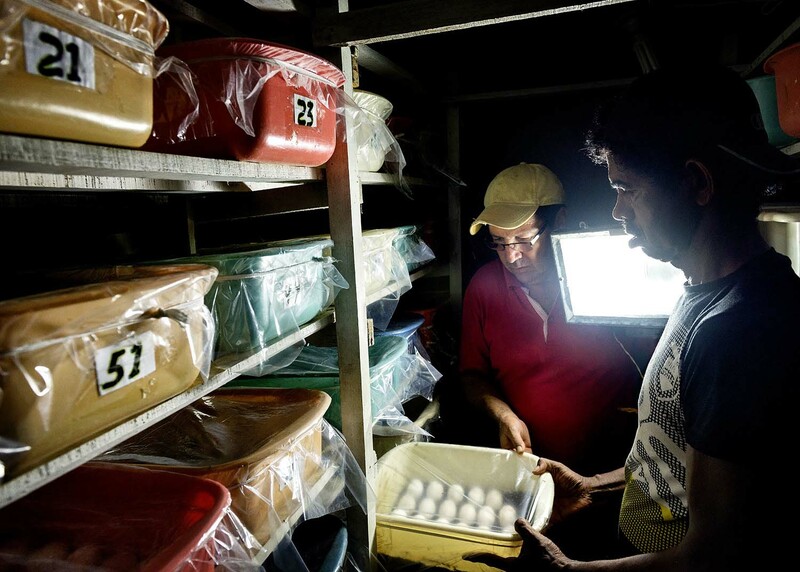 Inside the incubator room where the eggs are stored. Antibiotics (the blue liquid) are put into the caimans’ tanks to avert infections. A fully grown caiman is caught by hand and made safe with an elastic band around its mouth. The caimans are killed by a cut to the neck from a skilled operator. 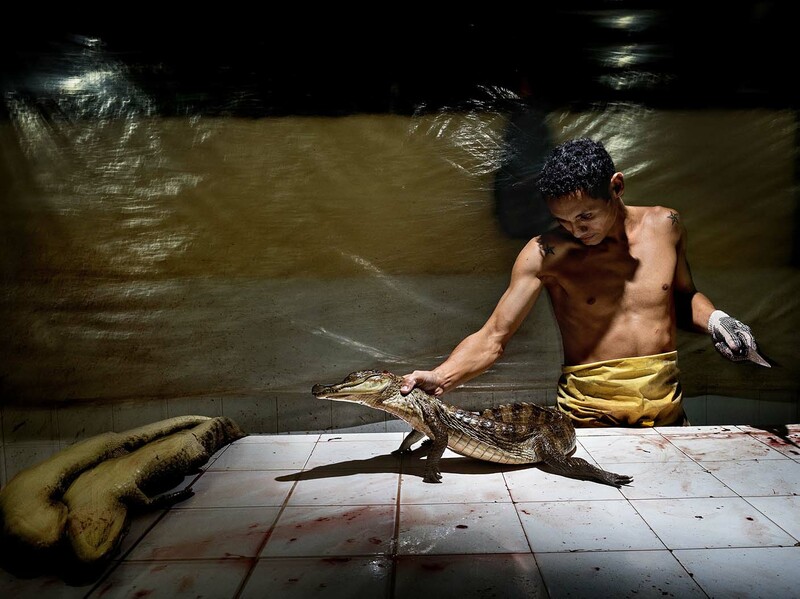 A worker checks the feeding in the caiman tanks. 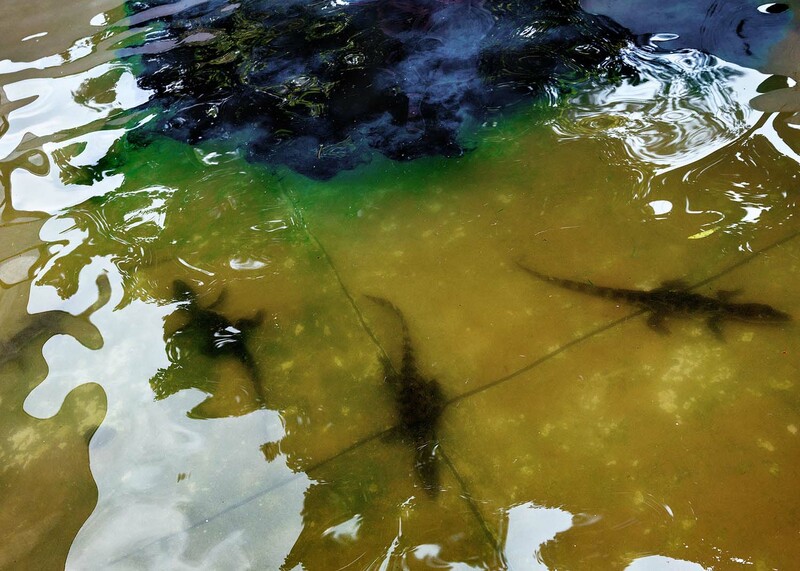 Twice-weekly feeding time for the caimans. 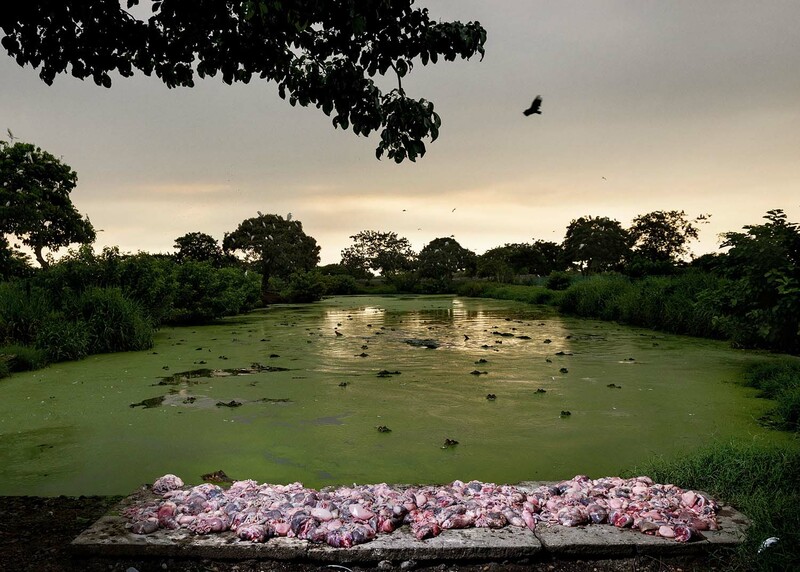 They are fed with tons of minced beef offal and other waste from cattle, with some caiman meat mixed in. The dead caimans are unloaded for skinning, which is all done manually. Thousands of skins stretched out in the open after being cleaned and salted. They will be exported to Singapore for the eastern market. 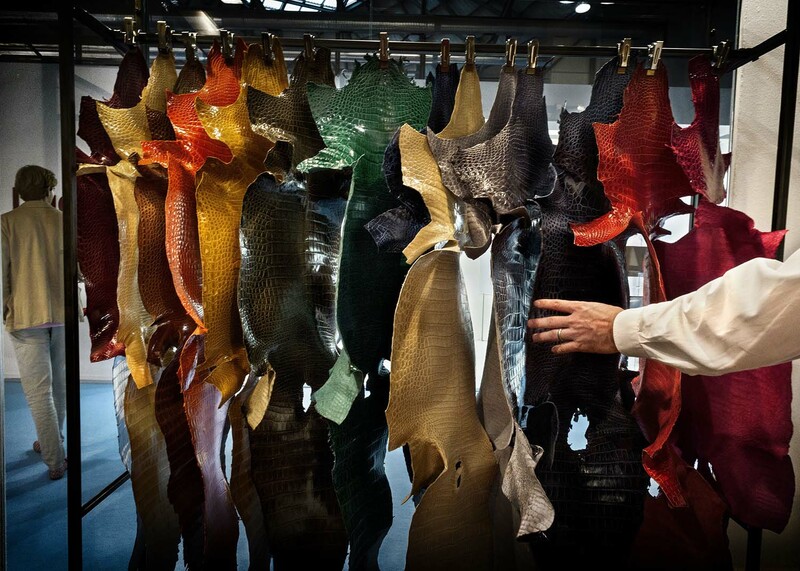 Dyed and finished caiman skins on display at the Lineapelle leather fair in Milan, which attracts fashion companies from all over the world. 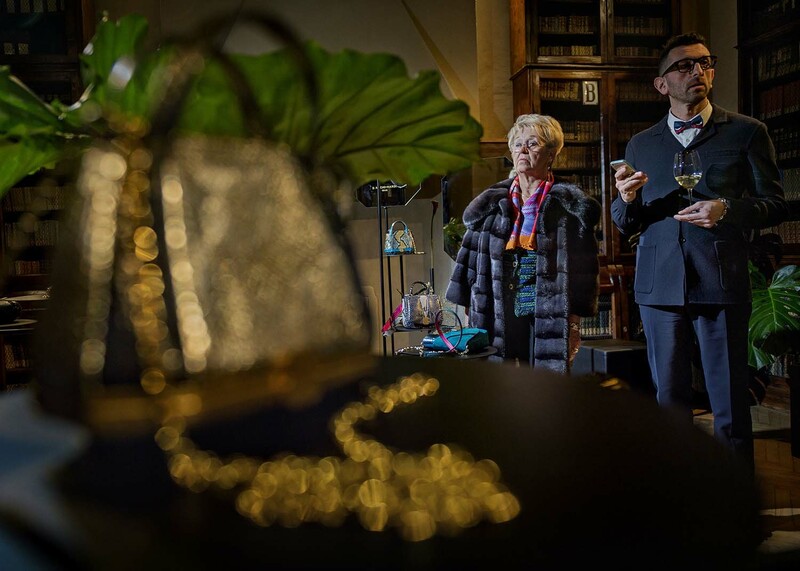 Buyers at a Milan fashion week event at Bianchi e Nardi, a handbag designer that specialises in ostrich, python, crocodile and lizard leather. 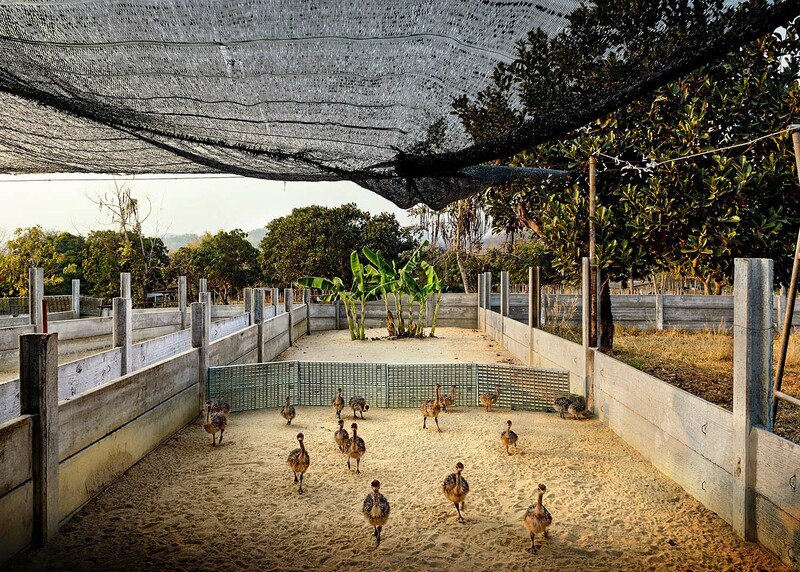 Chicks at Malai Farm, an intensive ostrich breeding unit in the Ratchaburi province of Thailand, near Bangkok. In the ostrich herd, males are kept separate in order to avoid violent rivalries. They are kept in pens with two females each. 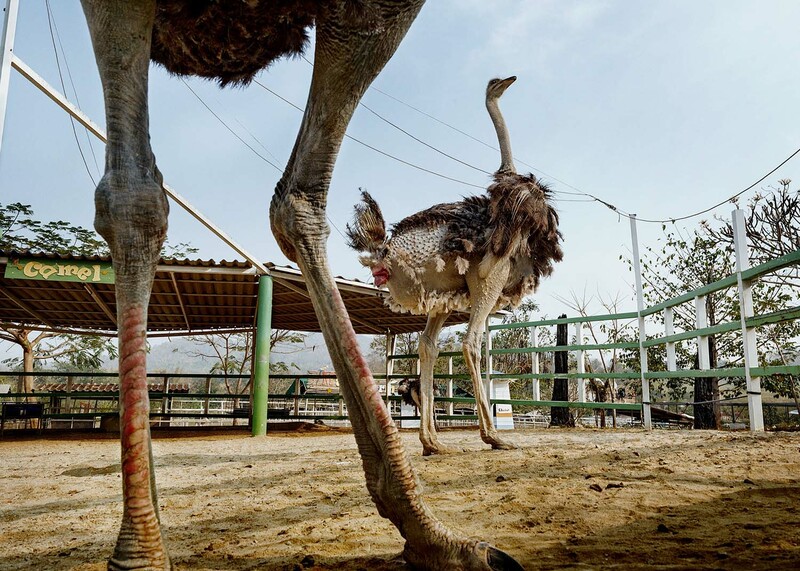 The ostriches are captured and placed in small trucks, then transported to the killing unit. 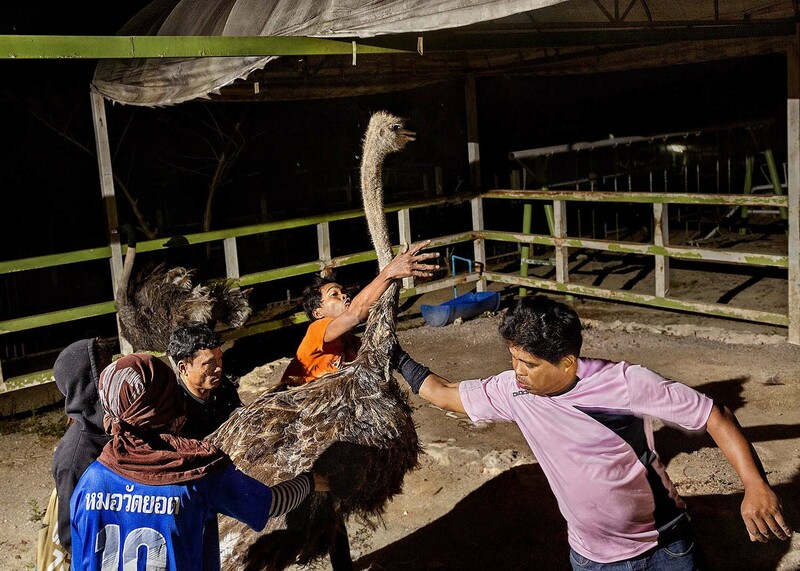 Workers control the struggling bird while it is dispatched with a knife by the man on the left. 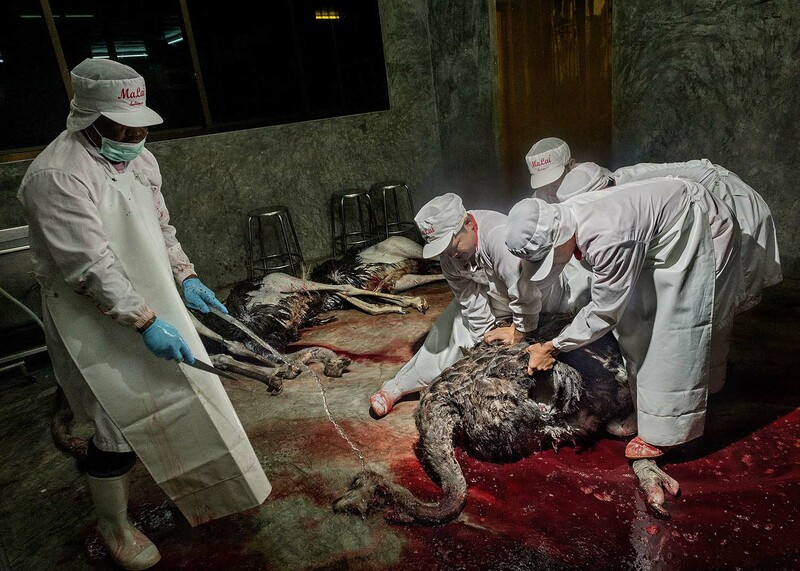 After the feathers are removed, the skins are separated from the ostrich bodies, then cleaned before being sent to a tannery. 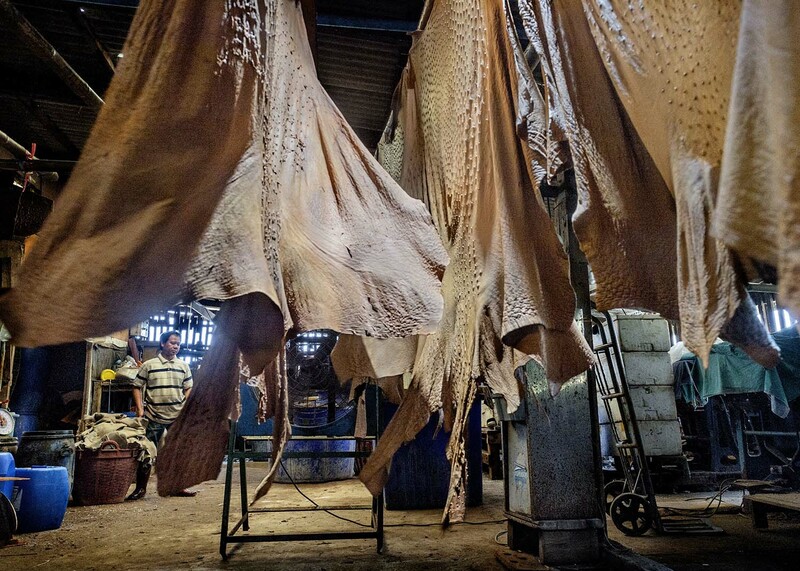 Inside a Bangkok tannery that specialises in ostrich and crocodile skins. 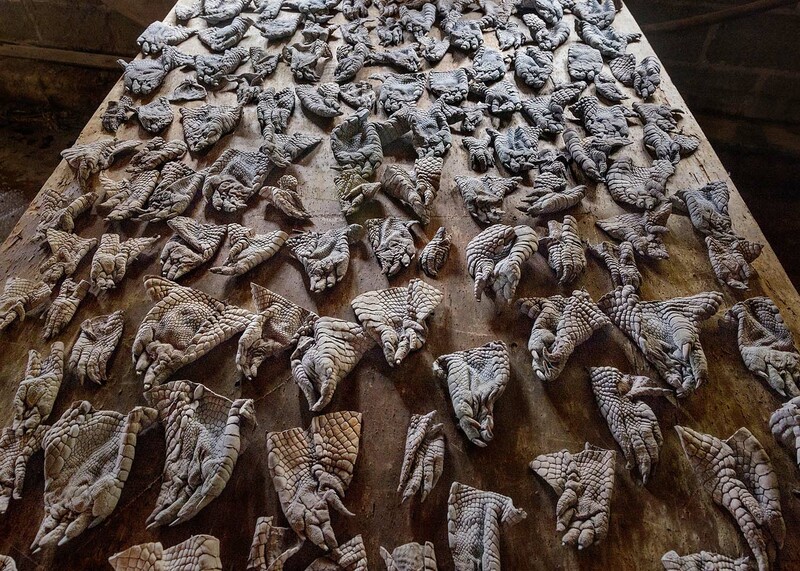 In the tannery, the clawed feet of crocodile skins are spread out to dry. Crocodile leather is used for a myriad of products including handbags, wallets, belts, diaries, jackets, shoes and bags. Since the mid-1980s it has become the species most used in high fashion today. 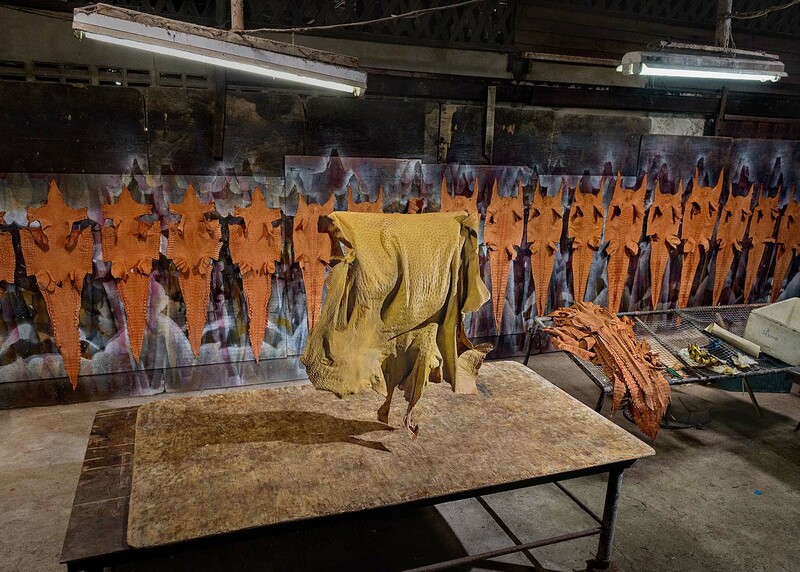 Ostrich skins are hung up to dry in the tannery. Ostrich leather is prized for its distinctive bumps from the empty quill follicles. It is particularly used in high fashion for very expensive leather boots and handbags. I took this portrait of Mr Chaow in a shopping mall in Bangkok. 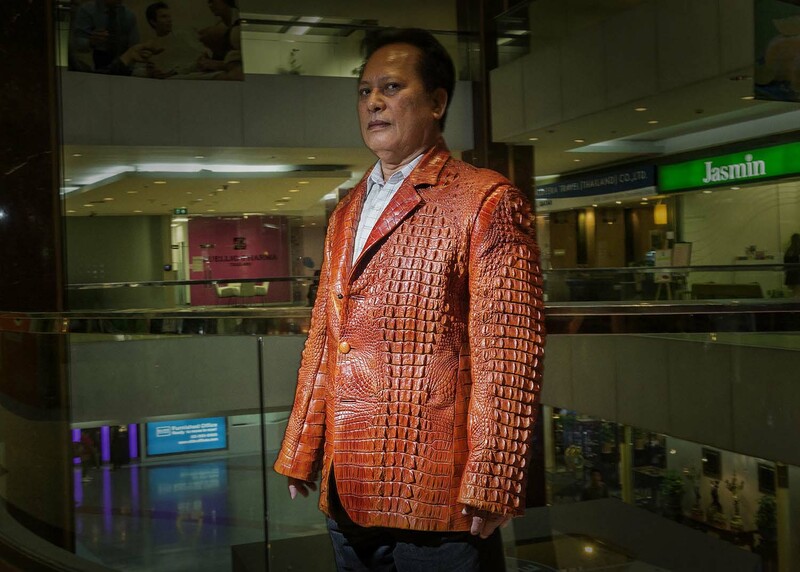 He was trying on a caiman jacket inside a luxury leather boutique to show his wife. 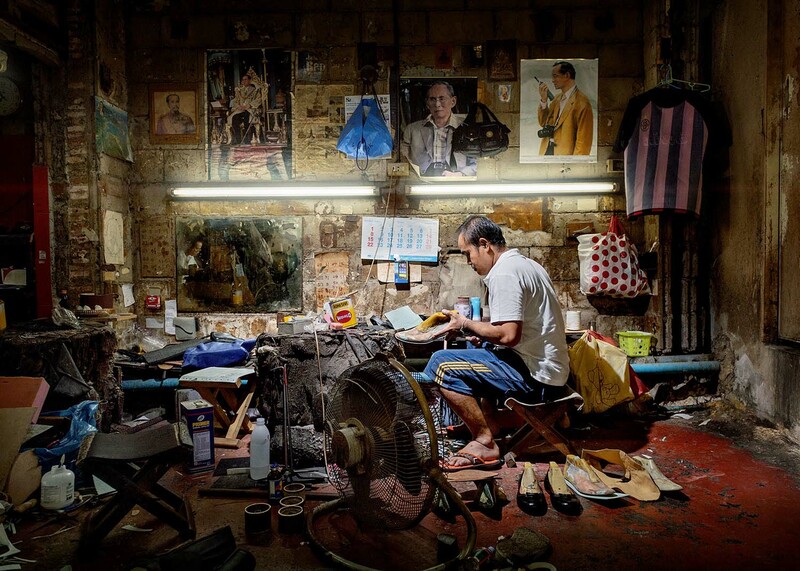 A cobbler in a tannery in Bangkok crafts handmade shoes using ostrich leather. 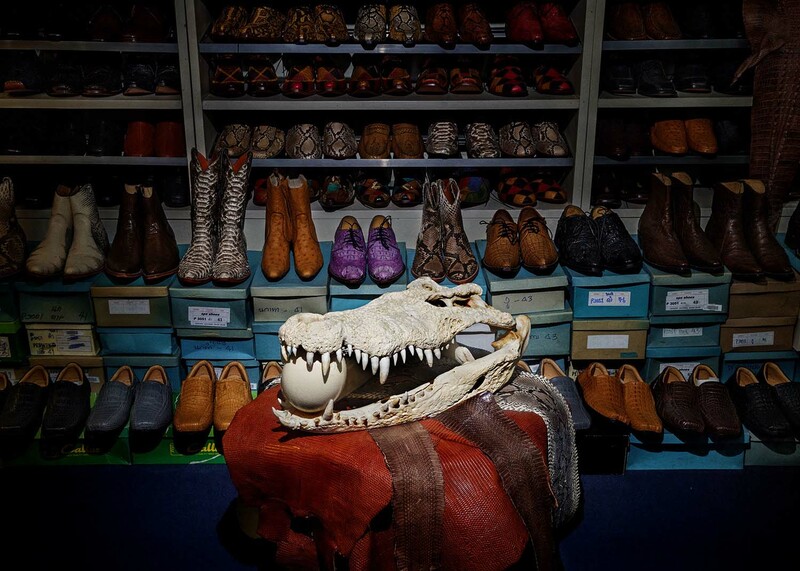 A luxury leather boutique in Bangkok displays a crocodile skull with an ostrich egg in its mouth for decoration. A model twirls her ostrich feather-trimmed skirt for clients at Studiozeta, a fashion brand showroom, during the annual Milan fashion week. 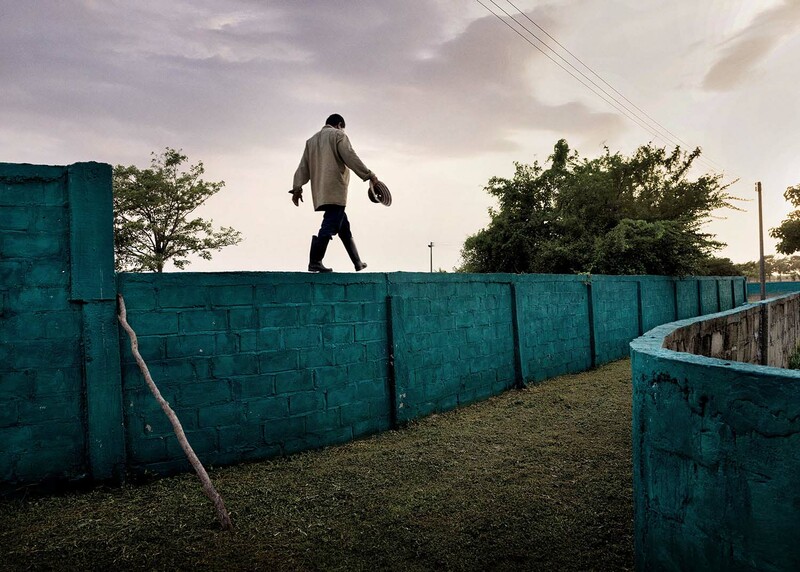 Paolo Marchetti is an award-winning photojournalist based in Rome. His long-term projects focus on political and anthropological issues and are regularly published in international magazines around the world. 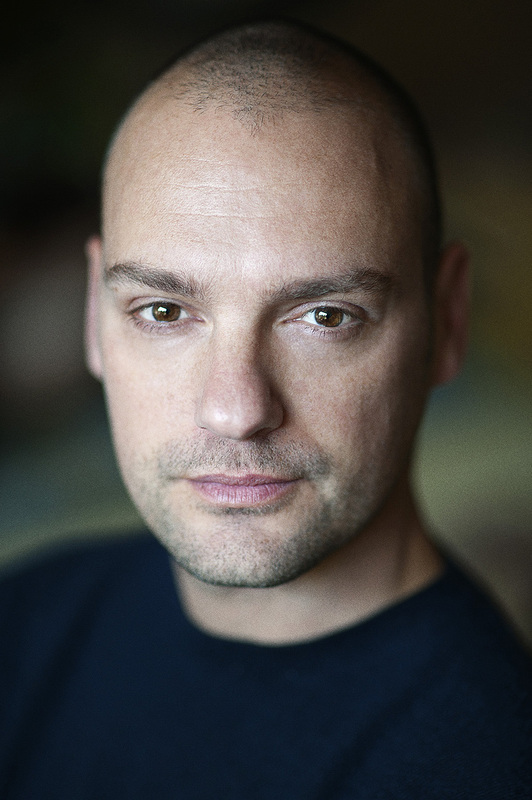 He is the recipient of the Getty Image Grant and the Alexia Foundation Grant. In recent years his awards have included the World Press Photo, as well as Picture of the Year eight times. He is part of The Photo Society of National Geographic photographers.